Since cucumbers are 95%-96% water, they are deeply hydrating and aid in eliminating toxins from your body. High water content provides relaxation to body and mind too. Cucumber itself fulfils the requirement of various vitamins that our body require in a single day. It nourishes our body with Vitamin A, Vitamin B and Vitamin C with some content of magnesium too. Whizz the cucumber in a blender until it becomes completely liquid, then add the drop of rosemary essential oil. Whisk the egg white until stiff, fold in the cucumber mixture and smooth over the face avoiding the eyes and mouth area. Remove after 15 minutes using a clean, damp washcloth. The silicon and sulfur in cucumbers help to stimulate hair growth. Drink it mixed with carrot, lettuce or spinach juice. You have seen beauty practitioners use slices of cucumber on their eyes. Placing chilled slices of cucumber on the eyes is a cliche beauty visual, but it really helps reduce under-eye bags and puffiness. It is found that the ascorbic acid and caffeic acid present in this vegetable can bring down the water retention rate which in turn diminishes the swelling and puffiness around the eyes. Cucumber is an excellent source of silica, which is known to help promotes joint health by strengthening the connective tissues. 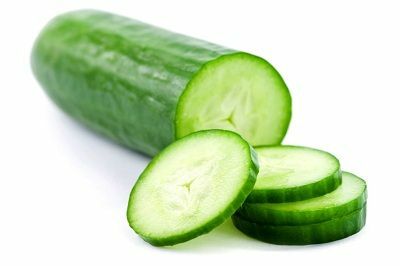 So intake of cucumber helps in reducing and eliminating joint pain and provides relaxation. When mixed with carrot juice, they can relieve gout and arthritis pain by lowering the uric acid levels. If you had too much wine with dinner and want to avoid a hangover, eat half of a cucumber before bed. Cucumbers contain enough sugar, B vitamins and electrolytes to replenish many essential nutrients, reducing the intensity of both hangover and headache. Cucumbers can help you lose weight by offering great nutrition and high-water content. It is also one of the very low calorie vegetables; provide just 15 calories per 100 g. It contains no saturated fats or cholesterol. Digestive problems like heartburn, acidity, gastritis and even ulcers can be cured by the daily consumption of fresh cucumber juice. These benefits of cucumber are availed due to its Dietary fibers which drive away the toxins from the digestive system and hence promote the digestive process. Moreover, the alkalinity of the minerals in cucumber juice effectively helps in regulating the body’s blood pH, neutralizing acidity. Several studies show that compounds in cucumbers help to fight cancer. Cucumber is known to contain three types of lignans named as- lariciresinol, pinoresinol and secoisolariciresinol. These three lignans have a strong in connection with reduced risk of several cancer types, including breast cancer, ovarian cancer, uterine cancer and prostate cancer. Teeth and gum diseases especially pyorrhea can be treated effectively with cucumber juice. It contains dietary fibre which provides massage to the teeth and gums. It also increase salivation and this again brings a neutralization of the acids and the alkalis within the oral cavity. So regular intake of cucumber in the form of salad provides high immunity to your teeth against various dental diseases.